I packed up and left early. Took the 8:45 AM train to Blarney. I made the mistake of bringing my backpack with me. I had a nice hangover too. Plus, I decided to skip the shower. Actually, I thought I'd be showering a lot less on this trip. Blarney Castle is definitely the best castle I've seen. Part of this is due to the beautiful setting in the green hills, and the little streams flowing. I climbed up the very steep cantilevered steps to the top of the keep. I had arrived before most of the tourists, so I was up there with only about ten people. I have a feeling that it is hard to get up there when it is crowded, due to the narrow stairs. Anyway, the Blarney Stone was up there, and I saw a girl kiss it. It really looked gross, but apparently people of all ages do it. Climbing down the stairs with my pack was really cutting things close. There was a lot of graffiti on the walls. It was a very small, personal castle for tourists to visit. After the castle, I went to the Rock Close, an ancient druid ceremonial piece of land on the grounds. I was really surprised by the sights, such as the Wishing Steps, Witch's Cave, and Druid's Cave. Some of the trees were over 1,000 years old. The druid ritual sites were over 2,000 years old. Very cool, and I was practically alone in the area. The whole garden/park is cool because it really encourages exploration. I found this out when I entered Badger's Cave and the castle's Dungeon (with my flashlight). Both were cool and damp. I went to the end of the Badger's Cave, I think. The Dungeon creeped me out though, and I didn't want to go too far in by myself. When I turned out my flashlight, it was pitch black. This made me think about those crazy spelunkers. I'm on my way to Killarney now. 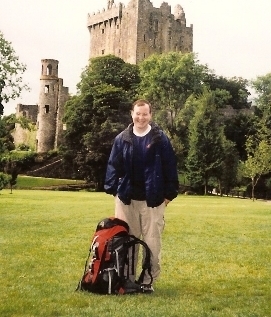 I think Blarney Castle has revitalized my enjoyment of Ireland. I didn't really like Cork as a city. Too big. I've found it easier to eat fast food after a few pints. Needless to say, my bowels are up in revolt about my Irish diet. Oh, I bought my official Irish wool sweater today. I got it on sale, along with tape number one of Irish pub songs. Is every goddamn train smoking in Ireland? We pulled into the first station where we arrived twenty minutes late. Another train let off a whole bunch of kids. There train had been no smoking, so they all got onto my train quite excited about the rest of their trip. The train quickly filled with smoke and noise. I was pissed for a bit, as I gagged on the billowing smoke. Then I put my Irish pub tape in my Walkman, and was happy with what I heard. Plus, I took a piss. I saw myself in the mirror, with my new sweater on, and I looked about forty years older. Sigh. The train arrived in Killarney about 1 1/4 hours late. For the first time in the British Isles, I had to go to a second choice hostel for a room. My thoughts about staying in the Rail station hostel were changed when I saw my room with skylight, and the large showers. I walked around the town, and started my pub crawl. I went to the Laurels Singing Pub in hopes of good trad music. Instead, I found myself among tour groups of senior citizens. I felt about 25 years younger than everyone else. A guy with a stomach as big as a keg of Guinness sang, and hosted the show. I got out after an hour (I had to get my cover charges worth of entertainment). The next pub was no better. The two girls and guy (old enough to be their dad) were not smiling or even enthusiastic, as they played their trad music. They actually brought me down. I ended up that the Beer Garden which is an outdoor courtyard (w/stage) surrounded by two bars. I finally got to hear some good music. Unfortunately, they finished up at 11:30 PM, so I only caught the end of the show. As I search for some down home traditional sessions, I'd probably be better off in a rural area. I went home drunk. Read more of my exciting adventures Backpacking in Europe, or view my photos on Flickr.